Made from the finest Australian potatoes and slow cooked in sunflower oil, Red Rock Deli chips boast a blend of sweet and salty flavours. 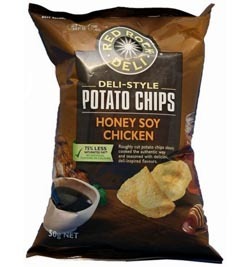 The subtle flavours of soy sauce combined with chicken, join harmoniously with the sweetness of Australian honey to make this gourmet potato chip. Potatoes, Sunflower Oil, Sugar, Palm Oil, Glucose Powder, Salt, Yeast Extract, Dextrin, Natural Flavours, Chicken Powder, Maltodextrin, Corn Starch, Chicken Fat, Honey Powder, Onion Powder, Natural Colours (Caramel, Paprika Extract, Turmeric), Soy Sauce Powder, Garlic Powder, Spice (White Pepper). Contains Milk or Milk Products, Soybeans or Soybean Products. Great stuff, best Aussie export IMHO. PS. mate, Darren, you're more cooked than the actual chips themselves. I love these crisps, the best flavour I've ever had. Also there is a lot of flavour on these crisps, unlike others.